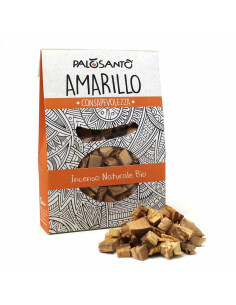 · Herborea srl sells its products under the brand Palo Santo®; this brand ensures the best product, quality of work and respect for the environment. · The Bursera graveolens (botanical name) is a typical tree of the South American Pacific coast, closely related to incense as it belongs to the same botanical family (Burseraceae). Palo Santo wood stakes are used exactly as the conventional incense sticks: light one end, extinguish leaving a smouldering ember, and enjoy the enchanting aroma that purifies your rooms. Our spiral-shaped copper incense holder will let you forget all fire safety worries. Just relax and enjoy the intoxicating essence of this 100% natural incense. It is a hand-crafted object in a symbolic and esoteric style that will add a touch of sophistication to your home.